Ever thought of stealing bandwidth of internet in a local Lan ? well..I usually do it when I am surfing net at night and need more speed for downloading games and movies..and you can do that too. Well its done using ARP Poisoning..Sounds geeky but its the technical name of network sniffing.Basically,sniffing is used to get passwords – encrypted or unencrypted in a network. But it can also be used to choke the network bandwidth and getting maximum bandwidth in a single system. For those who don't know how it happens,lemme give you a little insight on how it happens. Below is an example of a normal network.Now as we can see,that we are working on a laptop and we have to sniff out a target computer .All the systems are getting data via a switch which is itself connected to a router.The Router has a MAC address which is in this case is not binded to a particular IP. All the data is routed to a switch which is catered to systems using a switch. 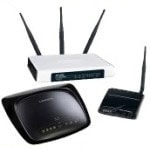 The systems connect to router through the MAC address of router.Technically,we have to spoof the MAC address of router so all the data is sent through our system (the laptop in this case) and we are able to see and analyze each packet of data.In simple words this process of spoofing is known as ARP poisoning.Also,in normal condition,data sent through LAN is unencrypted in nature. As we can see in the above diagram,we have now spoofed the MAC address and the data is sent through our system and we can view passwords and data. But hey wait..I said that I will tell you how to get maximum speeds ain’t it ? well..its easy. When you poison a network,and spoof the address,but if you have not yet started sniffing,then all the systems will look for data to your system and will not be able to access net.And you will be playing with full bandwidth !!! To do this, Download Ettercap and poison the network (shift + U then control + S ..do some homework and get the idea) but DONT START SNIFFING.Once you have poisoned it,you will be able to surf internet at maximum bandwidth whereas others wont.I used to do it in my net connection at night so nobody was able to complaint and stop it as soon as my downloads finished so I was way away from the hands of Law.BTW Ettercap is one of the best available tool for sniffing any network out there. I love it..
Start Menu –> Run –> type CMD and press Enter. If you network is being sniffed,then all the MAC address will be the same. I have downloaded ettercap from the link which you provided above but when I am running the setup, it install completely but when I run the exe file it shows that some dll files have been missing and I could not find the other version of the ettercap setup.Only the source codes were available and its not comfortable for us to compile them and run.Will you plese provide us the names of other good sniffers of LAN for speed hacks specially. And one more thing, if someone has poisoned our network then what is the way to get my speed back in its original form.As LAN is for all and one can't rule us merely by using a software. I tried to install it but a pack.dll error shows.